Sorbothane® SORBO-EASE Yoga & Workout Comfort Pads provide solid support and cushioning comfort. Creating a supportive and confidence building workout system. Place SORBO-EASE Pads under your hands, wrists, knees or elbows and enjoy! 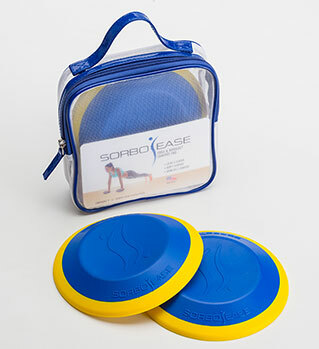 Sorbothane® SORBO-EASE Yoga & Workout Comfort Pads are designed to deliver - stability, comfort and pain relief. Flexible and lightweight SORBO-EASE Pads support and cushion the body - knees, elbows, feet, hands and wrists. Yellow Sorbothane® GEL - Provides Cushioning & Returns Energy. Blue Sorbothane® - Absorbs Up To 94.7% Of Impact Stress, Delivers Comfort & Helps Prevent Impact Injuries. Sorbothane® is recognized worldwide as the ultimate material for absorbing harmful impact and provides cushion to relieve stress to joints while exercising.